This beautiful "Mississippi Sax Case" harmonica case by Fender has a durable traditional gold tweed covering and end bound in brown with the Fender logo badge and its plush red interior replicates the look of Fender guitar and bass cases. By adding valves, or “wind savers”, to our brass reeds we’ve made it easier to play wide, multi-step bends in both the blow and draw cycles. Adding valves increases the harmonica’s efficiency by focusing more of your air onto a single reed, without overblowing. The blues never looked so cool! Features leather ends| locking brass latches| cotton interior. Room for up to 18 diatonic harmonicas and one chromatic harmonica. There's even a place for your favorite microphone (even a Bullet style mic will fit). 5 out of 5 stars - Fender Mississippi Saxophone Harmonica & Utility Case - Tweed , New! 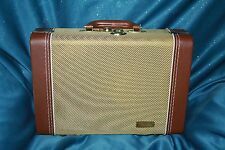 13 product ratings13 product ratings - Fender Mississippi Saxophone Harmonica & Utility Case - Tweed , New! 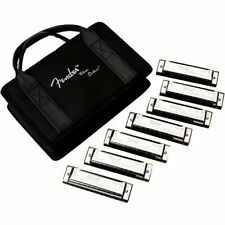 Fender Blues Deluxe Harmonica Set (7-Pack with Case, Keys of C,G,A,D,F,E and Bb). The only one used was the “G”. Got these fo Xmas but don’t use them. No returns and only ship to lower 48 states. Questions please ask! NEW - FENDER HOT ROD DELUXE HARMONICA. Adding valves increases the harmonica’s efficiency by focusing more of. we’ve made it easier to play wide, multi-step bends in both the blow and draw. Designed for smoking tone. Its classic tone and pitch is made possible with a molded PVC comb and brass reeds. Reed plates are also replaceable. - 10-hole, diatonic harmonica with molded PVC comb. - Versatile for all levels of players with its classic tone and pitch. This professional grade harmonica was made by Seydel for the folks at Fender and it was made as a superb quality professional harp to the highest standards. The harmonica is optimized for peerless performance with rounded cover plates, hole openings and dividers, ensuring the finest in Fender comfort and style. 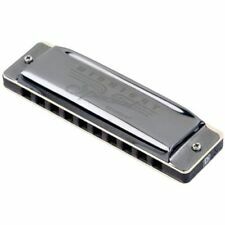 NEW - FENDER HOT ROD DELUXE HARMONICA. Adding valves increases the harmonica’s efficiency by focusing more of. Designed for smoking tone. our popular harmonicas. By adding valves, or “wind savers”, to our brass reeds. 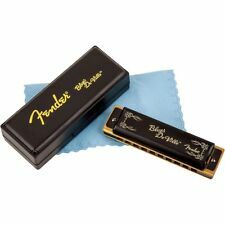 THE OTHER LOOK OF LEGENDARY Perfect for the seasoned harpist or those who are just starting out, the Fender Blues Deluxe Harmonica is versatile enough for any level of player. Seven-key sampler set: C, G, A, D, F, E, Bb. Its cis made possible with a molded PVC comb and precision phosphor bronze reeds. Traditional shape and black satin covers will make your harmonica look as good as it sounds. Reed plates are also replaceable. If you've got the blues, you need a Fender Blues Deluxe Harmonica to show it. Deluxe with This Fender Harmonica. Fender Blues Deluxe Harmonica Features 10-hole, diatonic blues harp has classic style with great reliability for years of blues music. This professional grade harmonica was made by Seydel for the folks at Fender and it was made as a superb quality professional harp to the highest standards. Fender creates instantly recognizable tools of the trade for the world’s most demanding musicians, including Blues Traveler’s unsurpassed harmonica player, John Popper. Type Diatonic. SKU: 0990702007 – Manufacture: Fender. If you've got the blues, you need a Fender Blues Deluxe Harmonica to show it. Fender Blues Deluxe Harmonica Features Each 10-hole, diatonic blues harp has classic style with great reliability for years of blues music. The harmonica is optimized for peerless performance with rounded cover plates, hole openings and dividers, ensuring the finest in Fender comfort and style. New Gear: If you’re not satisfied, neither are we. If you've got the blues, you need a Fender Blues Deville Harmonica to show it. With your diatonic, 10-hole Blues Deville cupped in your hand, you can forget everything but the music, knowing your harp's phosphor bronze reeds will sound bright and soulful with every note. They have a clear, arresting tone and exhibit the durability a practicing, gigging harp player requires. New Gear: If you’re not satisfied, neither are we. It’s that simple. By adding valves, or “wind savers”, to our phosphor bronze reeds we’ve made it easier to play wide, multi-step bends in both the blow and draw cycles. Adding valves increases the harmonica’s efficiency by focusing more of your air onto a single reed, without overblowing. The harmonica is optimized for peerless performance with rounded cover plates, hole openings and dividers, ensuring the finest in Fender comfort and style. 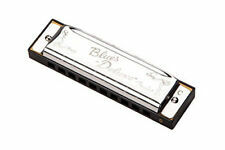 Shine a ever-loving light on your folk and blues songs with this high-quality Fender 10-hole diatonic harmonica. Carry your diatonic harmonica collection in style with this stylish case that includes room for all your accessories—including a microphone. Harmonica case with secure locking latch. If you’re not satisfied, neither are we. Adding valves increases the harmonica’s efficiency by focusing more of your air onto a single reed, without overblowing. Includes polishing cloth. Valve blow reeds 1-6. Valve draw reeds 7-10. This set of seven harmonicas will have you ready for anything on the bandstand.